Click Here To See New Adventures of Superboy #19 Comic Book! 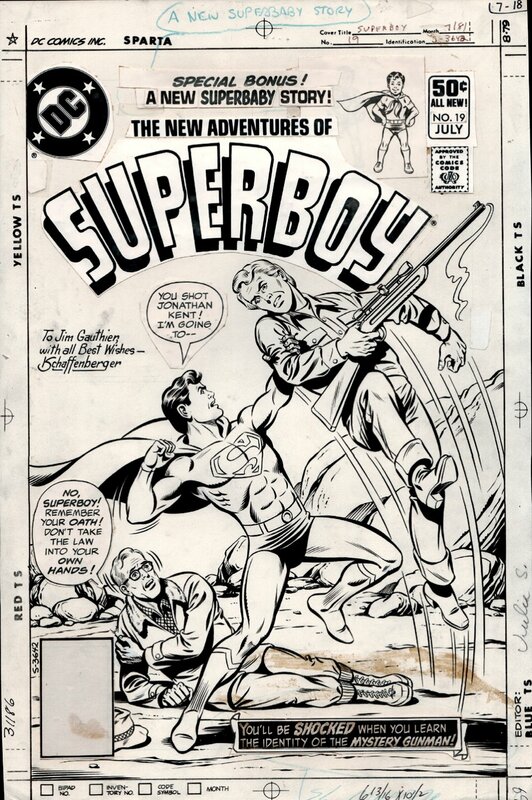 Check out this very nice Bronze Age 1980 Superboy cover, which was penciled by the great DC artist: Kurt Schaffenberger, and inked by the late great Dave Hunt, from the story titled: "Zero Hour for the Kents!" 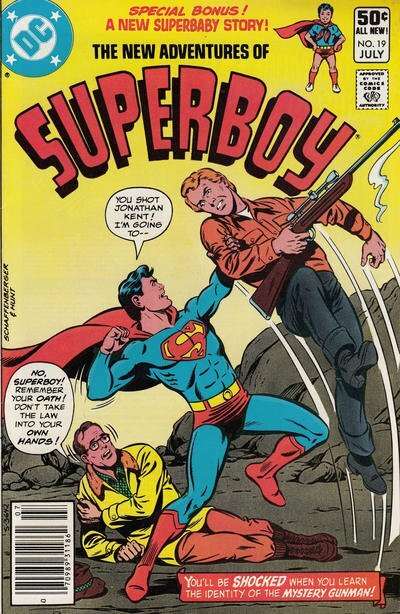 This nice cover features Jonathan Kent on the ground, Shot ruthlessly by an NRA supporter, As Superboy picks him up with his super strength and gets ready to punch him out. ***** AS AN EXTRA BONUS....The Superbaby image at the top of the cover was 100% drawn, and then they statted the image and moved it over to the right an inch, but all drawn art is under the stat! ****** Compare this nice cover art to the published comic book in the red link above! ALL art on our website (including this one) are able to be purchased with VERY fair time payments, and trades are always considered towards "ANY" art on our website! Just send us an email to mikeburkey@aol.com and we can try to work something out.